Bubsy: The Woolies Strike Back: What Went Wrong. 2017 was an excellent year for games that made you feel like a kid. Sonic Mania was an homage to the days of old when I sat in front of my Genesis after school trying to navigate Hill Top Zone, and Super Mario Odyssey felt like playing Mario 64 all over, with its extensive open worlds and encouraged exploration. But, while everyone was busy reading the love letters from the past, they never took the time to sift through the junk mail on the side, or they would’ve seen it, lurking, festering for over twenty years, waiting for the right moment to remind us that not every game we played as a kid was worth revisiting. 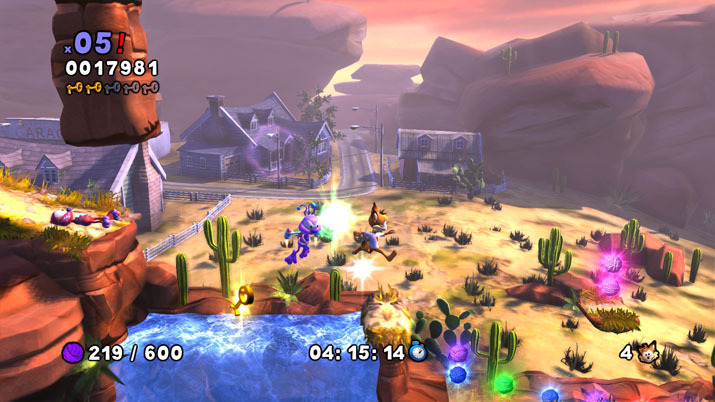 Revived in company Accolade’s own virtual Pet Sematary, Bubsy: The Woolies Strike Back (Bubsy) is a platforming game and the two-decades-too-late 5th entry in the Bubsy series. Once again, you take control of the walking one-liner, Bubsy himself, as he runs, jumps, and — now — pounces through roughly an hour and a half of new levels. The story itself is uneventful, but from the ‘cutscene’ that plays in the beginning of the game (see loud, shaking single frame image), the Woolies are back, and they are pilfering the precious yarn supply, including Bubsy’s own “Golden Fleece,” from the supposed cat-inhabited place in which Bubsy lives. Now, it’s up to Bubsy to save the day and get back everyone’s yarn and find his own prized possession. A fair story; it feels a lot like a story that games would use back when game cartridges were too small to contain enough memory to host real cutscenes, but this is only the first in a series of design choices which would have been barely appropriate in their own time, much less now. Before we start, it should be noted that Bubsy has excellent controls. Jumping, gliding, and using the new pounce ability feels excellent and makes traversing the levels a breeze. Sometimes the controls get slippery — it’s easy to fall off climbable walls or run into an enemy because of Bubsy’s momentum — but, for the most part, controlling Bubsy feels right, and this is a critical factor in what makes a side-scroller good. The levels themselves are bland, uninspired, and come in three flavors: Woods, Desert, and Space. With roughly four to five levels per zone, this makes for a short and sour experience. I had my game installed when I woke up and had it polished off by the time my toast was done (not really, but this game is short.) The levels themselves aren’t much to write home about. Vast, gaping landscapes peppered with yarn balls and enemies, a few hidden items or extra lives make for a thin excuse to replay a level for completion, especially considering anyone paying attention can see the distinct, breakable wall that hides every collectible in the game. Guarding these wooly wastelands, there are two enemies. Woolies and bees (and technically three, if you count robotic woolies that appear in the final few stages). Your biggest threat, however, is the awful hit detection. Enemies only die from jumping on top of them or pouncing into them, which is a sort of lunge attack that sacrifices a lot of control and isn’t a viable option when facing enemies in tricky platforming sections. Trying to jump on top of an enemy only to get killed from a one-hit kill by touching its side is infuriating and frequently happens due to the fact that some sections require you to bounce off enemies to travel upwards or across a large gap, and to add insult to injury Bubsy feels the need to dispense a snarky remark after every death. I couldn’t get away with a Bubsy review without mentioning the voice. God, the voice. For starters, I considered becoming religious when I saw that there was an option to turn Bubsy’s motor mouth off. Inversely, there was also an option to increase the frequency of his chatter. This option alone proves the existence of both a God and a Devil. But even on default settings, Bubsy feels the need to comment on everything. This is expected. This is what makes Bubsy, Bubsy. Jumping, pouncing, gilding, Bubsy always has a comment at the ready. The problem is that it feels like there might be three or four designated lines for every action, which is obnoxious. No Bubsy, I’m not interested in how you’re gliding. I don’t care that you’re the “Pounce Master” and I really don’t care for the “M-m-m-monster pounce” Quake reference. Don’t ruin Quake for me. Bubsy on the SNES had repetitive voice lines due to lack of storage; Bubsy on modern day systems has repetitive voice lines due to lack of good writing. Remember Gex? The smart-aleck lizard who barraged the player with commentary for the entire game? Gex was (relatively) funny. He made (now outdated) media references, he entertained the player (slightly more so than Bubsy) and had a marginally larger variety than Bubsy. Bubsy is still obnoxious and still makes me regret my ability to comprehend the language he’s speaking. Variety is all I’m asking for here: if you’re going to have a character that won’t shut up, at least reduce the chance that I’m going to listen to the same line more than eight hundred times in a standard playthrough. Even after a twenty-one-year Hiatus, Bubsy does not capture what makes a platformer fun. Some springs and a few rising platforms — and bees — are not the answer. In all honesty, I think Bubsy gets more flak than he deserves. The original SNES series wasn’t awful, I mean it got hard listening to Bubsy after he said the same lines for the hundredth time, but the gameplay has never been too bad, save for the abomination known as Bubsy 3D. 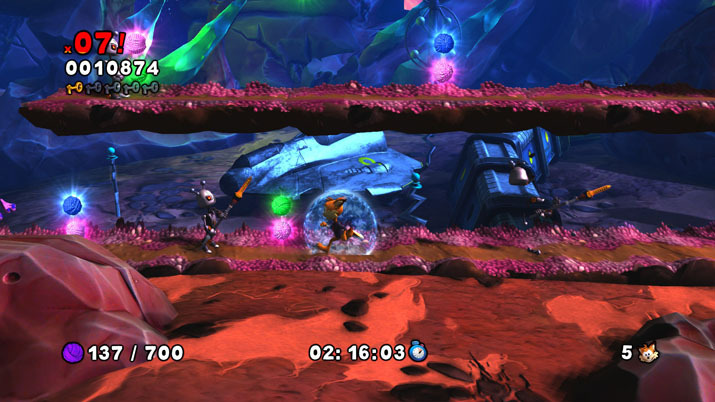 Bubsy: The Woolies Strike Back shares this tradition with its predecessors. It’s not too bad. It's fun in parts. But the levels are drawn out, have boring mechanics, and the experience as a whole lacks variety in every aspect. Bounce off an enemy, collect some yarn, find an extra life, next level. On top of this, the game costs thirty dollars. Yikes. The game leaves the player with an ominous message at the end: “Bubsy will return soon.” But, in all honesty, I didn’t feel like that was a bad thing. I want to see Bubsy come back, and I want to see him improve. This game was a good step forward with tight controls and an option to turn off Bubsy’s quips, but I’d like to see a game with more attention to core mechanics, not one designed to ride the nostalgia train and feed off the excitement we get when we see a game we played as a kid. A more significant level selection with worlds that don’t feel bland and repetitive, with new mechanics and a bunch of new enemies because if I have to see one more bee, I will throw my controller out the window. Just one more Bubsy game to make up for his past sins, and show the world that Bubsy means business. What could possibly go wrong?